The Orendain family poses gathers after receiving the proclamation honoring their patriarch from Rep. Vicente Gonzalez at the DoubleTree Suites hotel in McAllen. 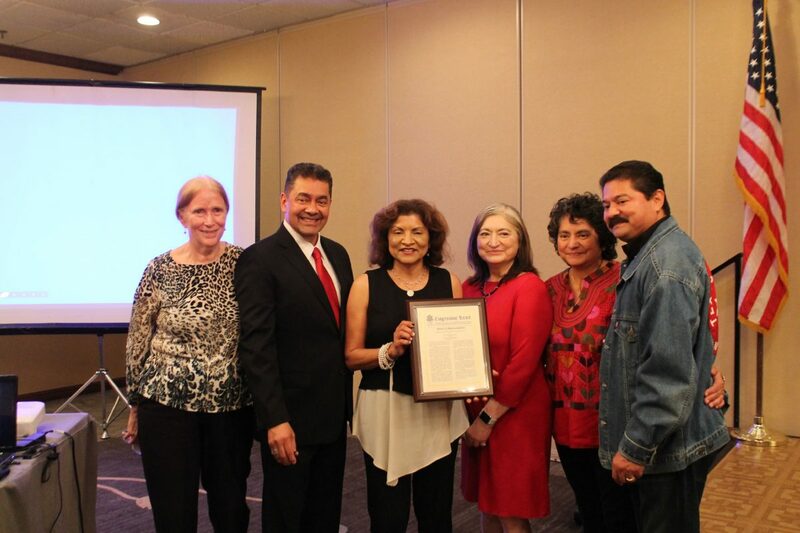 McALLEN — The family of a Rio Grande Valley civil rights leader and activist was honored Friday with the presentation of an official congressional proclamation at the Doubletree Suites hotel. 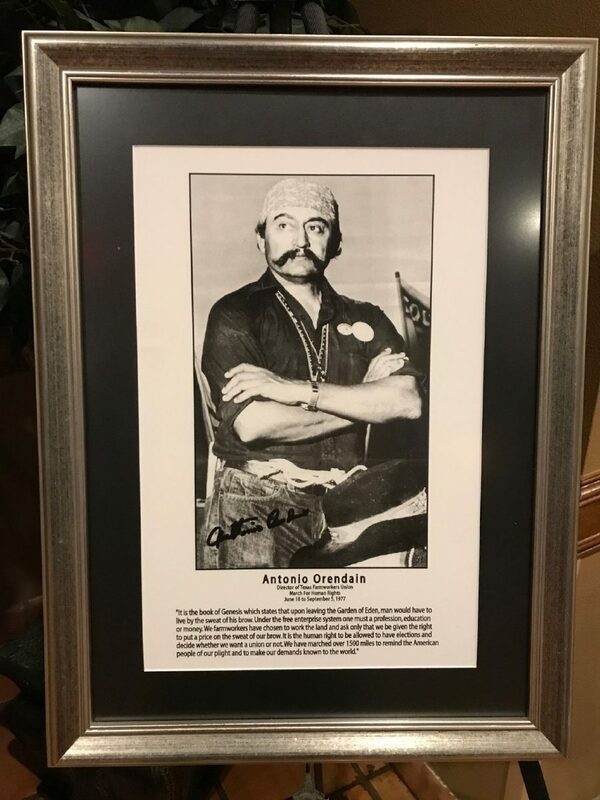 Antonio “Tony” Orendain was born in 1930 in Jalisco, Mexico, and died in 2016 in McAllen. He was civil rights leader, co-founder and original longtime secretary-treasurer of the United Farm Workers and founder of the Texas Farm Workers Union. He was an undocumented immigrant from Mexico and crossed over to the United States in 1950. Orendain was an agricultural laborer. He developed a goal that some day workers would be able to “put a price on the sweat of their own brow,” according to the proclamation. In the 1960s he joined the United Farm Workers in California and worked with Cesar Chavez and Dolores Huerta. Almost a decade later he had a falling out with Chavez and in 1975, through the teachings of Chavez, Orendain returned to Texas and began the Texas Farm Workers Union. After establishing the Texas Farm Workers, Orendain became a director and led members of the local United Farm Workers Organizing Committee on a march to the middle of the Roma Bridge. About two years later, he made a trip to Austin from San Juan, leading a group of 40 farmworkers on a march for basic human rights. An image of Antonio Orendain is seen on a plaque displayed Friday during a ceremony recognizing the civil rights leader in McAllen. As the group moved from Austin on to Washington, D.C., the march grew from 40 farmworkers to eventually 10,000 farmworkers and supporters. He became a lifelong activist and his mission was calling for higher wages and better working conditions for farm workers, the proclamation states. U.S. Rep. Vicente Gonzalez, D-McAllen, said he was inspired by Orendain and wanted to honor him in Congress. Orendain had five children, four of whom became lawyers and one a doctor. While Antonio’s children were growing up, he always emphasized education and for them to succeed. Orendain’s son Abel, an attorney, said he and his family were proud of him receiving the congressional recognition. “In 2009, the Texas Senate passed a resolution recognizing his work and the march to Washington D.C., so just a few years later, we’re happy for this acknowledgement,” Abel said. Antonio Orendain was a man who will be remembered for his lifetime of dedication and commitment to equal rights.